Situated off Otley Off Road at Tower Clinic just 5 miles north west of Leeds City Centre (just few minutes 0.8 miles from Horsforth railway station) in the heart of Leeds, our Otley Road Clinic offers a clinical, contemporary environment for all your treatment needs. There are ample free parking around the clinic and we’re within easy walking distance from the parade of shops and transport links, making it easy to get to us. Not to worry at all because there is excellent news for the residents of Leeds. To get rid of hair loss issues on a permanent basis, now you can find the right sort of hair loss treatment in Leeds. We are committed to providing different types of hair loss therapies from our several packages that is meant only for you. Hair loss is very common these days due to stress and environment. It is also true that everyone loses hair normally 50-100 hairs every day. But if one experience lots of hair thinning or patches then he/she may be experiencing hair loss. Some of the common causes of hair loss are stress, medical treatments and diseases. Women may suffer from hair loss due to child birth, etc. To get rid of hair loss, non-surgical hair loss treatment is a good option for both men and women. If you are looking for a fast solution then a non-surgical hair treatment is more permanent solution. New hairpieces look exactly like your natural hair with non-surgical procedure. Depending upon the severity of hair loss and the causes, non-surgical treatments are prescribed. There are many high-quality non-surgical treatments that are faster and less expensive than surgery such as PRP therapy and mesotherapy. Surgical hair loss treatment involves transplanting hairs and follicles from one area to other area of the head. The art of surgical hair loss treatment is rearranging the existing DHT-resistant hair follicles to provide a fuller head. It is a cosmetic procedure that is suitable for both men and women who are suffering from hair thinning, significant hair loss or bald spots. Surgical treatments can enhance the appearance through hair transplant technique by using your existing hair. In the human body DHT (Dihydrotestosterone) is the main reason for hair loss that is a natural metabolite. There are many surgical hair loss treatments that are safe, less painful and cost-effective such as FUE and FUT hair transplant. Nu is proud of the clinical expertise and client services that we offer. The clinic manager, Razwana ,has worked in the cosmetic industry for over 3 years and has extensive knowledge in hair loss procedures. At Nu Hair Clinic Leeds, you can access the best free consultations with expert surgeons to ensure you have all the information you require to make the decision that’s right for you. Nu Hair Clinic in Leeds has a very strong professional back up with experts having core knowledge about the treatment processes and fabulous customer care skills. Razwana, the Clinic Manager and the leader of the team here is performing fantastically by achieving complete customer satisfaction. Razwana has a valuable experience of 3 years in the Cosmetic Industry and has extensive knowledge about hair loss treatments. Nu Hair Clinic in Leeds has already established an unparalled foundation here with its quality of service and customer affability. Hair Transplant for men and women in Leeds & other cities has become almost a monopoly with our Nu Hair Clinic. This because in our exceptional customer care services before, during and after the surgical processes leave no room for complaint. Our surgeons are selectively recruited from all over the world because we believe in perfection and not just performance. Each and every patient gets individual attention from the hair experts. There is provision for detailed analysis about the patient’s physical health and lifestyles before suggesting any treatment. Our fees are pretty affordable which a major reason for our popularity. Our surgeons follow very careful surgical techniques of hair transplant mainly in cases of hair thinning and baldness. We receive huge crowds with the same problem because people feel lack of self confidence due to their receding hair lines. Follicular Unit Extraction (FUE) is a very widely accepted hair transplant surgery that we offer. It is nothing but grafting hair follicles from a more hairy region of the scalp to the barren zones by using local anesthesia. Apart from hair treatments for the scalp, we provide hair loss treatments for other body parts as well. Facial hair transplant and eyebrow restoration are the two most popular treatments in our clinic. Our non- surgical methods like Mesotherapy and Platelet Rich Plasma Therapy also give remarkable results. Is hair loss becoming your new found problem? Are you having trouble finding your hair almost everywhere in your home and workplace? Is it causing you distraction from your personal and professional life? Then its time you consider it seriously and seek guidance and advice from the experts in the industry on hair loss, how to overcome it and grow new hair or stop hair fall? The Nu Hair Clinic in Leeds is your answer, with the most advanced techniques, facilities and treatments offered by some of the best doctors, this clinic will offer you the solution to your hair loss issue. Located in the city centre with ease of access through bus, train and walking with ample parking space, the Nu Hair Clinic in Leeds offer the best environment to succumb your hair loss problem. Customers with different kind soft hair loss problems approach Nu Hair Clinic, we offer hair transplant for men and women, a surgical technique for hair thinning and baldness. We offer Follicular Unit Extraction (FUE) which is a widely used and accepted hair transplant surgery adopted by many patients. In this method, the patient is given anaesthesia and hair follicles from a hairy zone are grafted onto a bald area of the scalp. Eyebrow restoration and facial hair transplantation are the other two most popular treatments performed in Nu Hair Clinic, Leeds. Mesotherapy and Platelet Rich Plasma therapy are also opted by many clients who see visible results for themselves after the treatment. 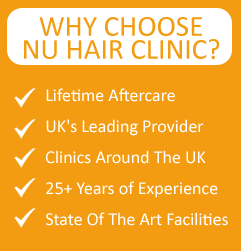 The post-operative treatments offered at Nu Hair Clinic are one among the best in Leeds. By following the strict instructions of the doctors on ways and methods to look after your hair after the treatment, you will have a good chance of growing a strong and durable hair which will last for a very long time. Although results will take time to be seen, following the aftercare instructions will give you long lasting beautiful hair you always wanted. Our surgeons offer free consultation to our patients to educate them about the problem and explain to them the possible solution. They are experts in the field and depending on the type of hair loss; they will offer you the treatment promising successful results. Our doctors though high on performance keep protection of the patients as first priority, all patients are given time and attention individually by the doctors to explain the cause, treatment and solution. They strictly analyse and investigate on the lifestyle observed by the patients before, which can be a factor to their hair loss issue; based on which they provide the necessary surgical or non-surgical treatment for the same. Most of our clients are happy not because their hair started to grow or their hair fall stopped, they are happy because they got back their lost self-confidence. A receding hair line puts a person in a position where he or she loses his or her self-esteem and self-confidence; making them invisible to the public and shunning away from the crowd. After the treatment they are changed from the inside and are able to make a strong public appearance without worrying about grooming or their physical self. The hair loss treatment at Nu Hair Clinic makes them confident without having to worry about their hair ever again.